The shampoo was great, but the conditioner just didn't seem to do the trick. It was good, but not great. It didn't *fix* my hair at all. So I went out and got a new conditioner. It was more serious this time. 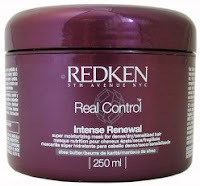 I started using Redken Real Control Intense Renewal. That was awesome. I love it and have been using it faithfully. My hair changed a lot. It's softer, smoother and stronger now. I have used it a lot the past few months and I have heard hair will only get so much from a product so I thought it was time yet again for a switch. 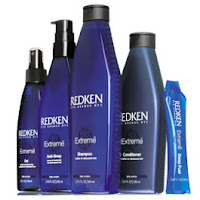 This time I am using Redken Extreme. 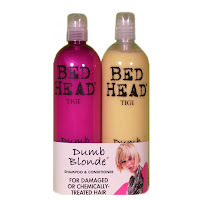 I just need some good stuff to stop breakage, and smooth out the frizz! I have used it a few times and so far I like it. I am just using the shampoo and conditioner. I want to get the deep treatments but I do have to draw the line somewhere. One thing at a time! I am pleased with results. I am tired of stray hairs sticking up everywhere or broken pieces jutting off my scalp so I am anxious to fix it and grow it out! I want my hair longer. I'll let everyone know how it goes. I mean, my hair gives a whole new definition to *chemically damaged*. Ha! So if it helps mine, I bet it helps yours too! Weakened Immune System Post Lymphoma? I was informed that the word is not loading for word verification. Thank you Duni. I noticed this on someone else's blog yesterday. I tried so hard to leave a comment but the word would not load. I didn't realize it might be doing the same on my own blog. Well I just wanted everyone to know they should be able to leave a comment now. I turned it off for both blogs. I have to approve each comment anyway so I am not too worried about spam. 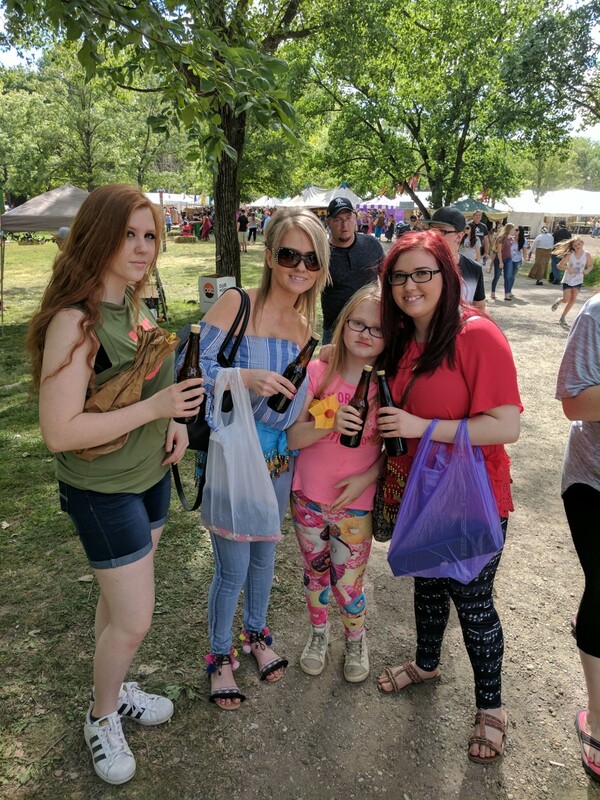 Please read my latest post below!! I always liked my chest. It was just right. Smooth. I never felt too bony or too heavy. I felt just right. I noticed right before the doctors diagnosed me my chest was a lot more full. You could not see my clavicle on my right side at all, but you could on the left. I found that so odd. Of course it was odd and something my doctor noticed immediately. So here is a before shot of my chest. And here are some after shots. First the surgery that started it all. The surgery was May 4th 2007. This was most likely the next day. I stayed in ICU. Remember I was also several weeks pregnant. 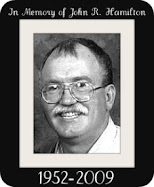 I am linking this one because it's a bit more graphic. I had staples in my chest and it's a pretty nasty looking cut. This is right after my port surgery. And another angle with biopsy scar and port. Now what my chest looks like with port gone and biopsy scar. It's pretty obvious here. I don't mind so much the scar as I do the indention. They had to actually shave off bone to get to the tumor so it dents in pretty good. One day, I hope to maybe fix that somehow. I try to remember they are my war wounds. You can't see it as well but I have a scar from the port that actually looks a little keloided. It grew and got red and puffy..sometimes itches. It's not gigantic or anything but I think I put a little makeup on it for my Halloween outfit. It did a good job covering it I think. It's easy to complain when your kids do something wrong but how about acknowledging when they do something so incredibly sweet that you have no words? My daughter Lexi does this frequently actually. She is my 11 year old daughter. She's my baby forever though, whether she accepts it or not. I kinda think she doesn't truly mind....yet. She is the type of girl who will actually tell on herself when she does something wrong. She does fight with her sisters plenty. She'll be 12 on March 16th so I have to say that preteen or "tween" behavior is coming out too. The good thing for her is that I totally remember being HER. I remember my 12th birthday like it was yesterday. I know what gift I got from my sister. I also remember at that age you start thinking you know more than everyone, including your parents. "This represents mom, she's the flowers and they won't stop growing because my mom survived cancer. She's my hero. This represents my dad. He's growing more love for my mom everyday. It's always Summer when you're around."